Other photos: Photo 1, Photo 2, Photo 3, Photo 4, Photo 5, Photo 6, Photo 7, Photo 8, Photo 9, Photo 10, Photo 11, Photo 12, Photo 13, Photo 14, Photo 15, Photo 16, Photo 17, Photo 18, Photo 19, Photo 20, Photo 21, Photo 22, Photo 23, Photo 24, Photo 25, Photo 26, Photo 27, Photo 28, Photo 29, Photo 30, Photo 31, Photo 32, Photo 33, Photo 34, Photo 35, Photo 36, Photo 37, Photo 38, Photo 39, Photo 40, Photo 41, Photo 42, Photo 43, Photo 44, Photo 45, Photo 46, Photo 47, Photo 48, Photo 49, Photo 50, Photo 51, Photo 52, Photo 53, Photo 54, Photo 55, Photo 56, Photo 57, Photo 58, Photo 59, Photo 60, Photo 61, Photo 62, Photo 63, Photo 64, Photo 65, Photo 66, Photo 67, Photo 68, Photo 69, Photo 70, Photo 71, Photo 72, Photo 73, Photo 74, Photo 75, Photo 76, Photo 77, Photo 78, Photo 79, Photo 80, Photo 81, Photo 82, Photo 83, Photo 84, Photo 85, Photo 86, Photo 87, Photo 88, Photo 89, Photo 90, Photo 91, Photo 92, Photo 93, Photo 94, Photo 95, Photo 96, Photo 97, Photo 98, Photo 99, Photo 100, Photo 101, Photo 102, Photo 103, Photo 104, Photo 105, Photo 106, Photo 107, Photo 108, Photo 109, Photo 110, Photo 111, Photo 112, Photo 113, Photo 114, Photo 115, Photo 116, Photo 117, Photo 118, Photo 119, Photo 120, Photo 121, Photo 122, Photo 123, Photo 124, Photo 125, Photo 126, Photo 127, Photo 128, Photo 129, Photo 130, Photo 131, Photo 132, Photo 133, Photo 134, Photo 135, Photo 136, Photo 137, Photo 138, Photo 139, Photo 140, Photo 141, Photo 142, Photo 143, Photo 144, Photo 145, Photo 146, Photo 147, Photo 148, Photo 149, Photo 150, Photo 151, Photo 152, Photo 153, Photo 154, Photo 155, Photo 156, Photo 157, Photo 158, Photo 159, Photo 160, Photo 161, Photo 162, Photo 163, Photo 164, Photo 165, Photo 166, Photo 167, Photo 168, Photo 169, Photo 170, Photo 171, Photo 172, Photo 173, Photo 174, Photo 175, Photo 176, Photo 177, Photo 178, Photo 179, Photo 180, Photo 181, Photo 182, Photo 183, Photo 184, Photo 185, Photo 186, Photo 187, Photo 188, Photo 189, Photo 190, Photo 191, Photo 192, Photo 193, Photo 194, Photo 195, Photo 196, Photo 197, Photo 198, Photo 199, Photo 200, Photo 201, Photo 202, Photo 203, Photo 204, Photo 205, Photo 206, Photo 207, Photo 208, Photo 209, Photo 210, Photo 211, Photo 212, Photo 213, Photo 214, Photo 215, Photo 216, Photo 217, Photo 218, Photo 219, Photo 220, Photo 221, Photo 222, Photo 223, Photo 224, Photo 225, Photo 226, Photo 227, Photo 228, Photo 229, Photo 230, Photo 231, Photo 232, Photo 233, Photo 234, Photo 235, Photo 236, Photo 237, Photo 238, Photo 239, Photo 240, Photo 241, Photo 242, Photo 243, Photo 244, Photo 245, Photo 246, Photo 247, Photo 248, Photo 249, Photo 250, Photo 251, Manufacturer Provided Image, Manufacturer Provided Image, Manufacturer Provided Image. 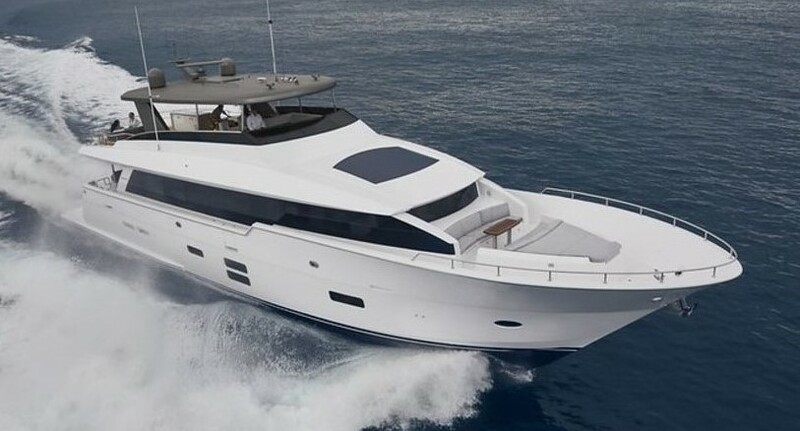 The "Sea Dozer" is one of the few 80' Hatteras's built with both upper and lower helms. This option gives the pilot the best vantage points and access points. While using the lower helm you can enjoy the climate controlled interior, and if you are seeking more of the outdoor experience simply go up a few steps to the bridge. She also features wing helm controls, that give you the ability to work the boat while looking directly over the sides. In short the Sea Dozer offers the captain and crew and her guests the best possible ease of use. SYS Yacht Sales is pleased to assist you in the purchase of this vessel. This boat is centrally listed by Reed Yacht Sales - Grand Haven Office.